In the faded light of Harry Hope's 1912 skid row bar, a group of fallen men, like ghosts haunting the wreckage of their own lives, await the annual arrival of Hickey (Lee Marvin). This year, however, the charismatic salesman brings not the usual rounds of drinks and slaps on the back, but an unwelcome message of sobriety. 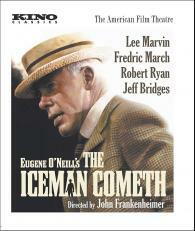 Hollywood legends Fredric March and Robert Ryan performed alongside relative newcomer Jeff Bridges in a brilliant cinematic experiment that captured the existential dread of O'Neill's play, the capstone of which is Marvin's haunting suggestion of the madman that hides beneath Hickey's ribald, garrulous exterior.